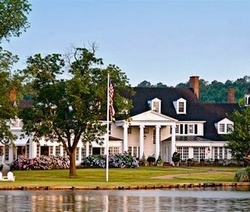 Relax and rejuvenate when you babymoon at this luxurious manor house resort and spa, located just off Chesapeake Bay. You can kick back and enjoy the scenery on this 25 acre estate while you watch the boats sail by. Experience the charm of St. Michaels with a historic tour or a horse drawn carriage ride. After a day of exploring and shopping (St. Michaels is home to some great boutiques), indulge in a Moon and Tide pre-natal massage at the resort's brand new Linden Spa. This 19th century mansion exudes old-world charm and romance. Rooms on the main floor and most on the second floor offer French doors that lead onto a deck, patio or verandah. Many of the accommodations also feature fireplaces and separate living areas. Maryland babymoon and Maryland romantic getaways package features subject to change. Please verify features directly with the facility at the time of booking.